Stephen Keshi has said he would "love to stay on" as Nigeria manager despite a difficult three years at the helm. The 52-year-old led Nigeria to their third African title in 2013 and the last 16 at the World Cup in Brazil. The Nigeria Football Federation, which allowed Keshi's contract to expire after the World Cup, has opened discussions with him in the hope of persuading him to return as Super Eagles coach. And BBC Sport understands the coach is keen to continue if contractual conditions are respected by his employers. His previous reign as coach was littered with problems over money, as he experienced a number of delays in receiving his salary, and issues around his control of team selection. The football authority also failed to provide Keshi with an official car and accommodation as stipulated in his previous three-year contract. The former Nigeria captain was also burdened with the responsibility of paying one of his assistants from his monthly-salary after the NFF refused to approve the assistant's appointment. These are some of the issues Keshi wants ironed out before he commits himself to a new contract with the NFF. 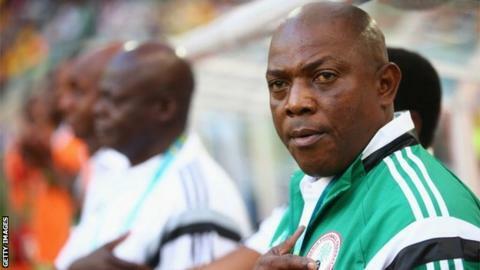 However, Nigeria's sports ministry is understood to feel Keshi has made "outrageous" demands over a new deal. He has reportedly sought a new deal that would double his $30,000-a-month salary, ensure monies are paid upfront to avoid delays and also allow him to pick his staff. But following a meeting of the NFF executive committee this week, the board "mandated the technical sub-committee to open channels of communication with Stephen Keshi with a view to extending his contract, as the NFF is still interested in working with him". It added: "The technical sub-committee is to report back to the executive committee within one week."